Want to help consumers secure the right finance? It’s time to back yourself with a Stratton Finance franchise. You’ll work independently and grow your own business with the support of our established brand, part of the carsales network. Our trusted partners and proven business systems means you’ll be able to help your clients finance almost any asset. Want to learn more? Jess Desmond started her Stratton franchise four years ago, click here to learn why she chose Stratton. Our franchisees come from a wide variety of backgrounds. Finance experience is preferable (and can mean a faster start). Other skills that are highly valued include interpersonal and networking skills, sales experience, emotional resilience, a willingness to learn and have energy and optimism. Having strong family and social support is also beneficial. A prospective franchisee that is known and knows the preferred market is an advantage. What hours must I work? 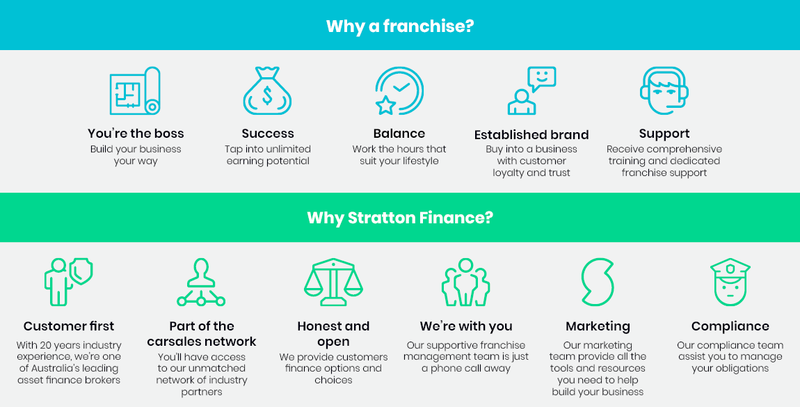 A Stratton franchise is a full-time commitment and you’ll want to be available to provide timely advice to your customers, but your hours of work can be flexible to suit your lifestyle. What ongoing support and training will I receive from Stratton? You’ll receive comprehensive training and ongoing support which will be provided by dedicated regional managers. You will meet a network of peers who you can work collaboratively with, sharing tips and advice. There will be access to our lender Business Development Manager’s and Stratton support teams including marketing, settlement & compliance. You’ll have regular one-on-one meetings, video catch ups and an annual conference. We have access to more than 20 premium lenders and bespoke finance products so we’re able to find a finance deal that’s right for your customer. As a franchisee, you’ll promote yourself within the local market as a Stratton local representative. You will be paid for the loans you settle and there is no cap to your earning potential. You are encouraged to develop a small to medium sized business engaging finance consultants and supporting employees. Stratton start-up costs are moderate in comparison to many other franchise business models, with total minimum start-up costs from $63,000. You’ll share the income generated from the deals you settle. There are some IT, conference and marketing levies and standard business costs which vary from franchisee to franchisee and may include phones, office and local area marketing. In time a branded car is an expectation. What resources do I need to start? It’s pretty easy to get going, all you’ll need is a phone, computer hardware, some office space and a can-do attitude. How fast is it to setup, get trained and start? 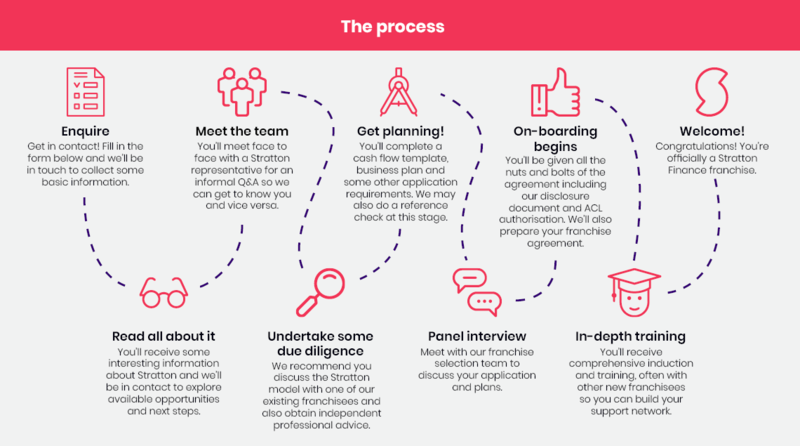 This can vary depending on your motivation, but most franchisees take between six and nine months from initial enquiry until commencement. What marketing will the franchisor do? We have a centralised marketing team that operates out of the office in Port Melbourne. Their role is to build the Stratton brand and grow lead acquisition across the whole business. We will assist franchisees in your marketing endeavours and may supplement marketing activities with web-based leads. Will the franchisor or other franchisees compete with my business? You’ll be allocated territories for the purpose of marketing, but some degree of overlap will be inevitable. We respect relationships that our franchisees have developed with their clients and/or referral partners.